Thanks to great weather and great company we had a wonderful Open Hangar Day and Fly-In to celebrate Zenith Aircraft Company's 20th anniversary. We thank all visitors and participants for making this a great event. 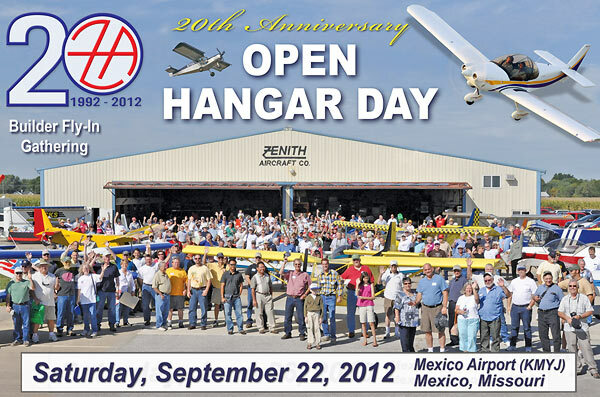 Zenith Aircraft Company's 20th anniversary OPEN HANGAR DAY and Fly-In Gathering is scheduled for Saturday, September 22, 2012, at the factory located at Mexico Memorial Airport in Mexico, Missouri. This will be our 21st annual Open Hangar Day and Fly-In Gathering at our kit aircraft factory, celebrating our 20th anniversary. All aviation enthusiasts, especially builders and owners of Zenith Aircraft kit planes, are invited to drive or fly-in for the day. The Zenith Aircraft kit production facilities will be open for factory tours and Zenith's factory demonstrator airplanes will be on display - on the ground and in the air! Company staff will demonstrate kit production and fabrication techniques used in producing the all-metal kit aircraft parts made at the Zenith Aircraft factory. We have many awesome door prizes to give away at the banquet, including a Dynon "Pocket Panel" portable EFIS, courtesy of Dynon Avionics, valued at over $1,400! 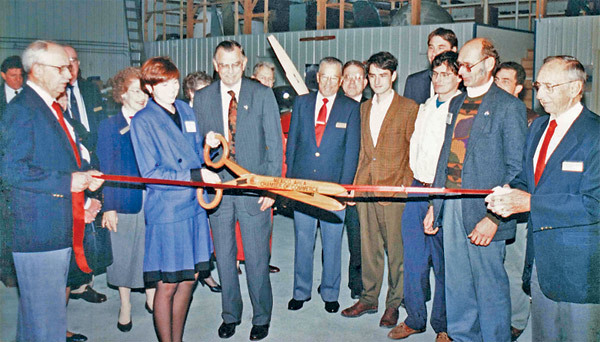 Read more on Zenith Aircraft Company's 20th anniversary. RSVP now for the banquet (and for workshops and seminars). PURCHASE your tickets for the Banquet. Did you know you can provide flight training in your Zenith? Earl Downs will present a seminar titled "Training in an Experimental (kit) Airplane" to discuss the rules about training with kit planes. Earl recently obtained an FAA Letter of Deviation Authority (LODA) to provide training in his Zodiac CH 601 XL-B, and he is an ATP rated flight instructor and administers Sport Pilot check rides. Zenith Builders Banquet at the Elks Lodge (next to the airport). 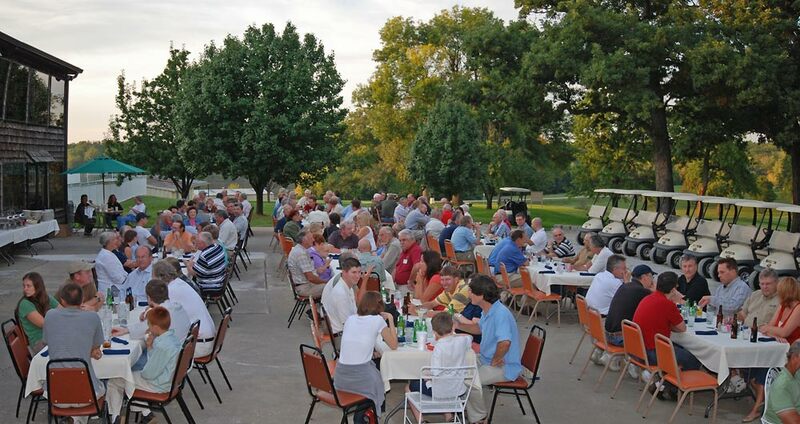 This is an informal social buffet dinner gathering of Zenith enthusiasts, builders, pilots and employees, to celebrate Zenith Aircraft Company's 20th anniversary, with special guest Rod Hightower, EAA's president and CEO. We have many awesome door prizes to give away at the banquet, including a Dynon "Pocket Panel" portable EFIS, valued at over $1,400! Cost: $16.00 per person. RSVP. Cash bar, opens at 5 pm. Saturday, 8 am - 3 pm: The Zenith Aircraft kit production facilities will be open for factory tours and Zenith's factory-demonstrator kit aircraft will be on display. Company staff will demonstrate kit production and fabrication techniques used in producing the all-metal kit aircraft parts made at the Zenith Aircraft factory, including cutting and pre-drilling kit parts on the CNC router, forming and hand finishing wing ribs and other kit parts, and aircraft aluminum welding demonstrations. We'll also have aircraft kits and parts on hand, and, once again, we'll offer visitors a chance to build their own small sheet-metal project in the Zenith factory (see below). 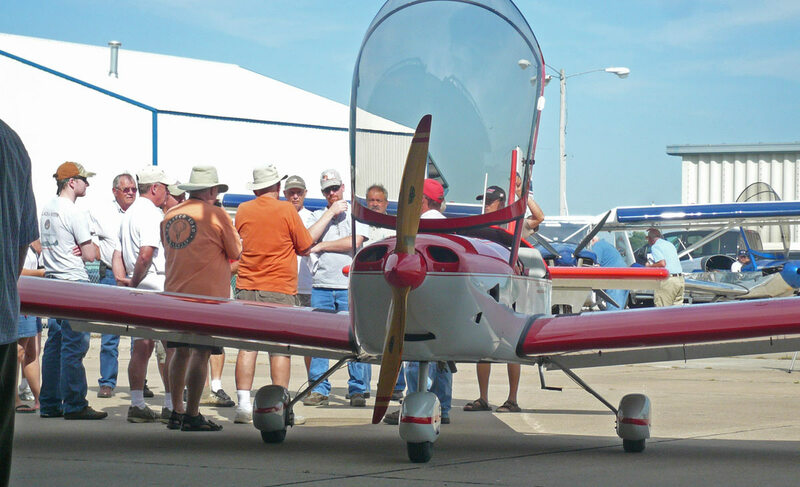 New seminars: Starting at 9 am, come learn all about the Sport Pilot license and Light Sport Aircraft (LSA) from Earl Downs and Buzz Devoll, and come hear the seminar at 11 am by Rod Hightower, EAA's president and CEO, on Experimental Amateur-Built (EAB) Aircraft Safety. Rod's safety seminar will include a discussion of the causes of EAB accidents, a summary of the NTSB's recommendations to FAA (as it relates to new EAB regulation) as well as first flight best practices. Join us at 10 am in front of the factory for the Zenith Aircraft Company official 20th Anniversary Celebration and Presentation, followed immediately by the annual group photo. Everyone is welcome! 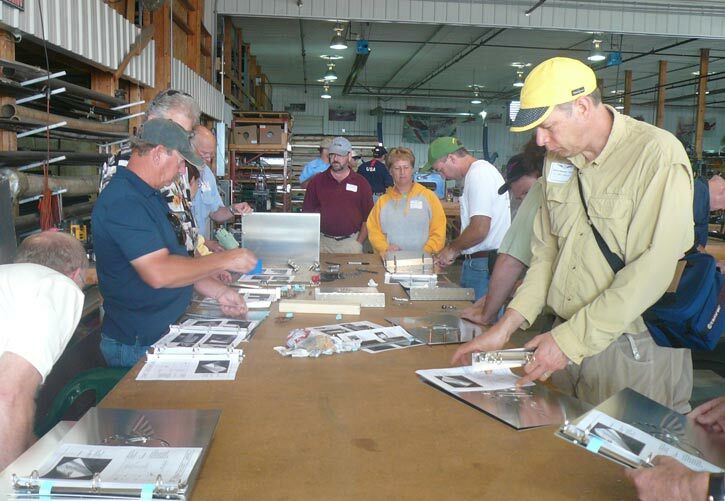 Hands-on Workshop: Visitors will be given the opportunity to "build their own" aircraft-aluminum binder for their Zenith documentation, as well as a custom made 3-ring all-metal binder assembly project. EAA's Homebuilders Community Manager, Chad Jensen, will share info on EAA's available resources to help builders, owners and pilots of amateur-built aircraft, including the technical advisor and flight advisor programs. Rod Hightower, EAA's president/CEO, plans to attend as our special guest. Steve Stroh from Dynon Avionics will demonstrate the newest available glass panel technology, including the SkyView and Pocket Panel portable EFIS. Robert Helms from UL Power North America will be on hand to represent the new generation of light aircraft engines. The UL Power aircraft engines are direct-drive air-cooled lightweight engines featuring full FADEC technology (with fuel injection and electronic ignition). A representative from Aircraft Spruce & Specialty will attend to hand out catalogs and showcase some of the thousands of items offered by this homebuilders and pilots superstore. 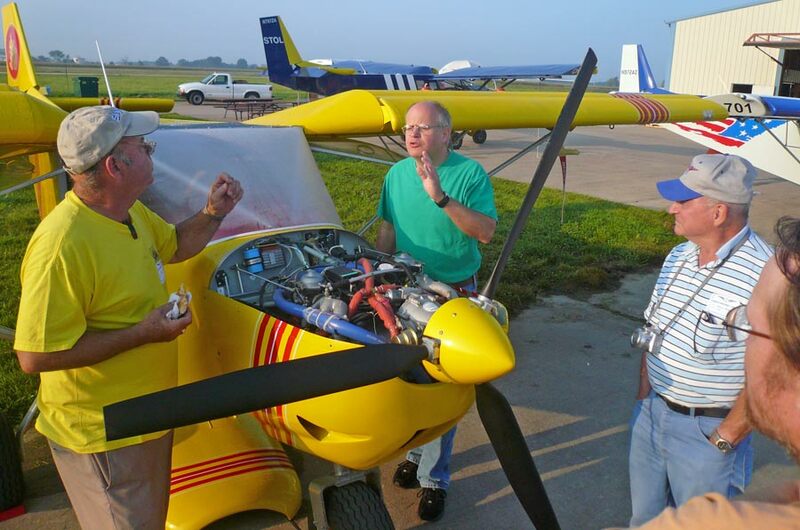 Mark Stauffer, builder and owner of a Zenith, plans to attend to represent Jabiru USA, distributor of Jabiru engines, the line of lightweight aircraft engines popular in many Zeniths. Mark will be available to answer Jabiru engine installation, operation and maintenance questions. 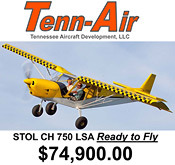 Pete Krotje of Tenn-Air plans to attend with a brand-new factory-assembled STOL CH 750 LSA (light sport aircraft), powered by the popular six-cylinder Jabiru 3300 engine. Tenn-Air is headed by the same principals behind Jabiru USA, which has extensive experience is the Light Sport Aircraft industry. Scott "Sky" Smith of SkySmith Insurance Agency will answer questions about aircraft insurance as it applies to building and flying a Zenith aircraft. 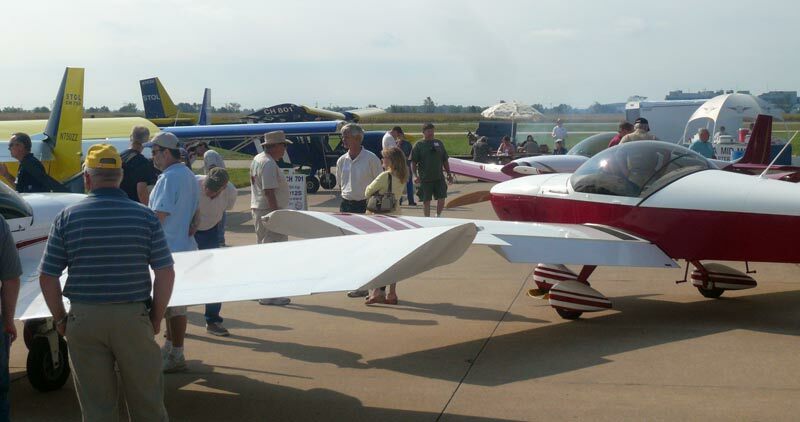 Mike and Sandy Loehle of Loehle Aero Coatings will share information about painting your Zenith aircraft using Loehle Aero Coatings high quality aircraft finishes. Registered visitors will receive a complimentary copy of CONTACT! magazine, a publication about experimental aircraft and engines for designers and builders. The current issue (#105) is the "Zenith issue" devoted to building and flying Zenith aircraft! Wick's Aircraft Supplies will hand out catalogs and showcase some of the builder supplies offered by Wick's (aircraft building materials and hardware, tools, and accessories). Doug and Lori Dugger of Quality Sport Planes (in Cloverdale, California) will attend to meet with West Coast Zenith builders, and discuss their builder assistance programs. Viking Aircraft produces a low-cost Honda-based 110-hp engine, and offers complete firewall-forward packages of the Viking-110 engine for installation in Zeniths. "Viking Aircraft Engines will participate with a fully operational CH-750 Viking Aircraft. This is your chance to see / feel this engine in action, for yourself. Expect the airplane to be more in the air, than on the ground. Get your demo ride in the fantastic CH-750 AND at the same time, experience the fun of Viking flying. Rides are free of charge and we will fly all day Saturday, with short breaks to show the engine." 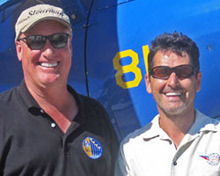 Aumie and Buzz Devoll of Buzz Air Flight Academy (with locations in Tennessee and Reno, Nevada) will be attending to discuss Sport Pilot flight training as well as transition training to Zeniths. 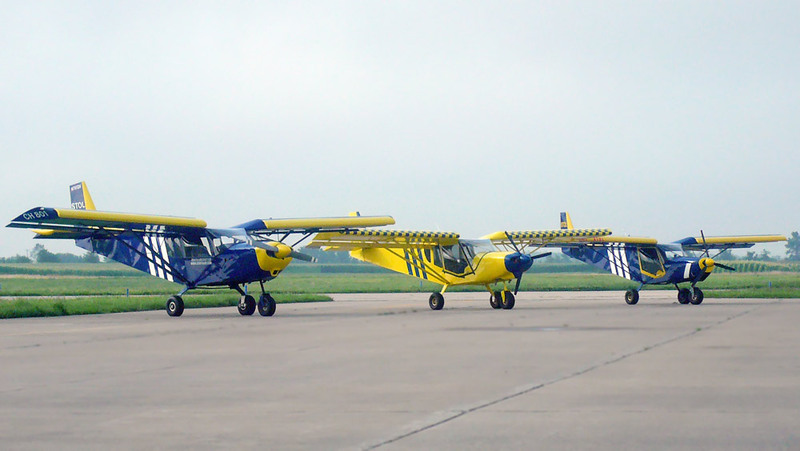 The flight school operates both a STOL CH 750 and a ZODIAC CH 601 XL-B / CH 650 S-LSA aircraft. George & Martha Happ from Matco Mfg., maker of light aircraft wheels and brakes used on many Zeniths, will be on hand to discuss the company's products and how to best install and operate them on your Zenith. 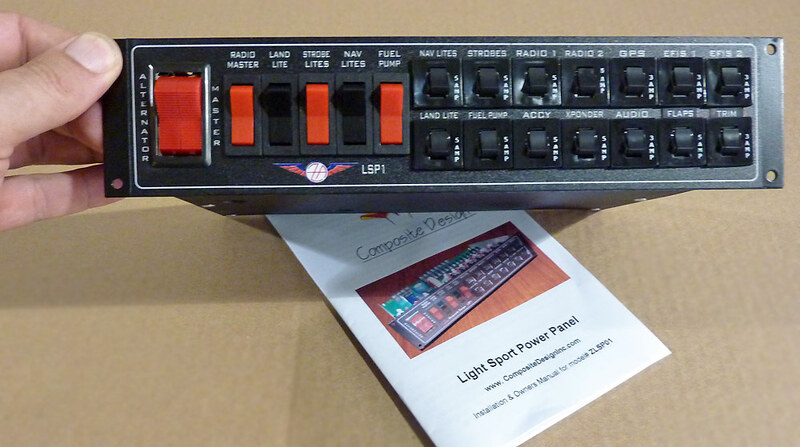 Wayne Lanza of Composite Design will showcase the company's new Light Sport Power Panel used by Zenith Aircraft Co. and supplied in the Zenith instrument panel kit. Chuck Preston from Kitplanes magazine ("The Homebuilt Aircraft Authority") will attend to meet with Zenith builders and suppliers. Zenith Aircraft kits, options, and parts will be on display and available to order. 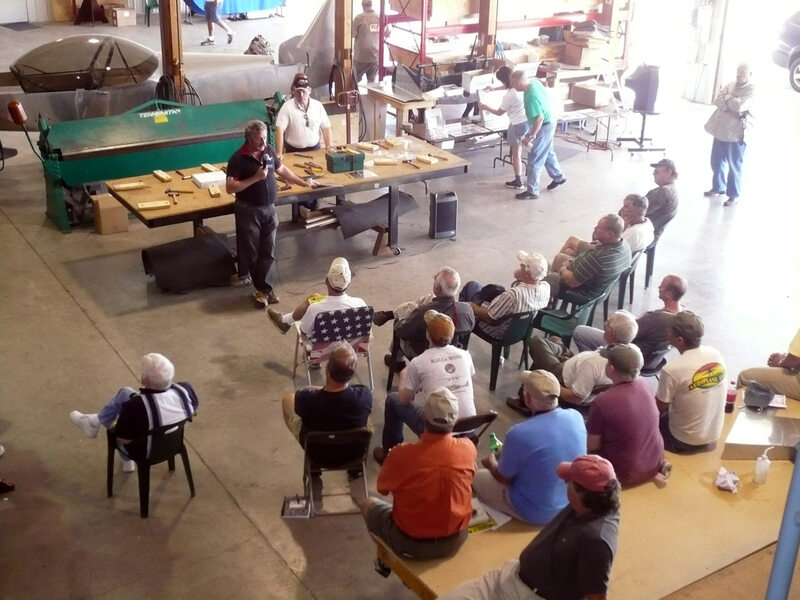 Customer Projects: Existing Zenith Aircraft builders and owners enjoy sharing information and details about building and flying their aircraft, and will be available to discuss construction, finishing (paint, upholstery, avionics, alternative engines, etc.) and flying their aircraft creations. Builders and pilots: Bring your photos to share with fellow builders, and let us know if you would like some indoor space for a display or presentation. Other products and services for Zenith builders and flyers. (Contact us if you are interested in showcasing products or services that are of interest to Zenith builders and flyers). The popular Zenith CH 650, STOL CH 701, and STOL CH 750 factory demonstrator aircraft will be parked at the factory. Demonstrations flights may be available by prior arrangement only. Note: Zenith will be holding a Rudder Workshop on Thursday and Friday prior to the Open Hangar Day activities. Accommodations: Due to the large number of visitors to Mexico on September 21 & 22, local hotels may fill up quickly. 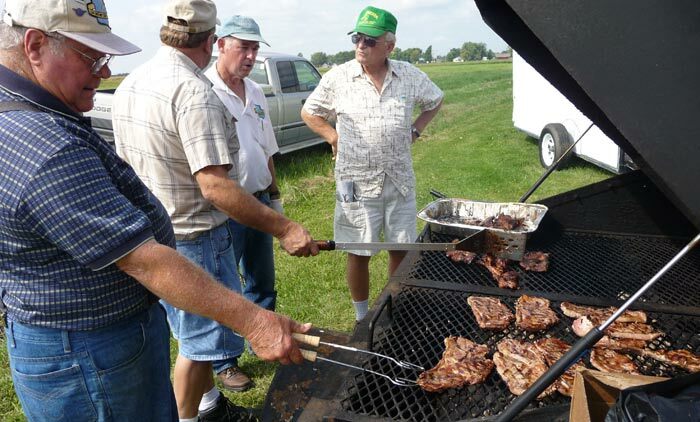 There are numerous additional hotels in the general area, as well as camping sites. Click here for additional information on accommodations. Owners of completed Zenith Aircraft are encouraged to fly-in for the activities and to show off their completed project to fellow builders (we will provide tie-down space and help facilitate ground transportation if possible). Mexico's airport (KMYJ) offers 24-hr self serve fuel at competitive prices, and has a new terminal building with 24 hour access to the pilot lounge (with showers and internet access!). Let us know of any special needs or requirements. 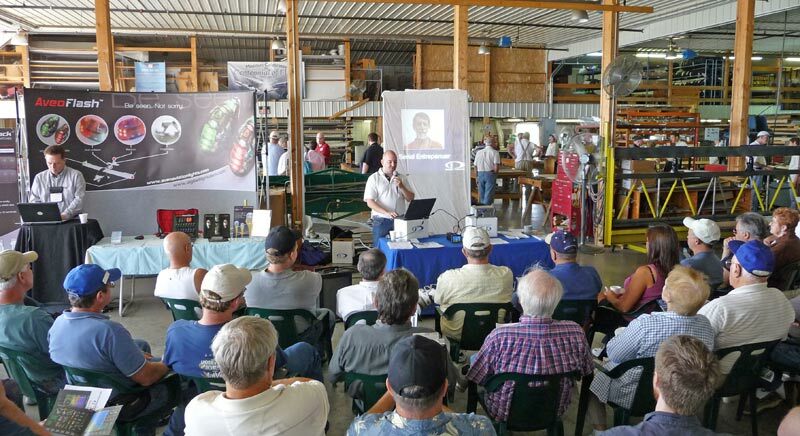 Hundreds of builders and enthusiasts attended last year's Open Hangar Day in Mexico, Missouri. The gathering is an excellent opportunity for owners and builders of Zenith Aircraft kits to meet each other and to tour the Zenith Aircraft facilities. 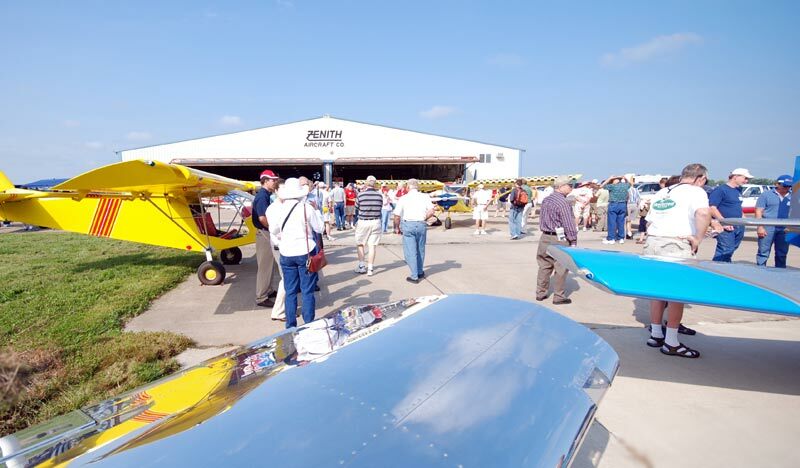 Located in scenic mid-Missouri, all pilots and aviation enthusiasts are invited to drive or fly in to attend Zenith Aircraft Co.'s annual �Open Hangar and Fly-In� day. For more information on attending, please call Zenith Aircraft at (573) 581-9000 or the Mexico Airport at (573) 581-0162. Photos from previous Open Hangar Days. Gus Warren discussed and showed how to thoroughly inspect a Zenith aircraft prior to your first flight, and how to adequately preflight your aircraft before every flight. This seminar included an actual inspection using a itemized checklist. Gus, who is also an A&P mechanic and flight instructor, answered questions about Sport Pilot and Light Sport Aircraft (LSA). Typically several dozen Zeniths fly-in for the Open Hangar day activities. Workshops and seminars kept builders busy all day. Owners of completed Zenith Aircraft flew in for the activities and to show off their completed projects to fellow builders. Builders and their planes pose in front of the Zenith factory for the traditional group photo: Join us and be part of our annual Zenith Group Photo at 10:30 on Saturday morning. We'll try to include as many Zeniths as possible in the group photo. Mark Townsend presented a workshop on building your own Zenith from plans-only, covering the tools, materials and skills needed to build your own Zenith plane from just a set of blueprints (as opposed to the kit). Builders were given the opportunity to "build their own" all-metal binder for the Zenith plans set. 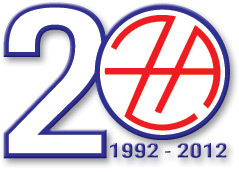 Click here to purchase new Zenith apparel - 20th anniversary t-shirts and hats! Note: All scheduled events and times are subject to cancellation or change without prior notice.